SEONGNAM--(Korea Newswire) January 21, 2014 -- Anritsu Company introduces the Microwave Site Master S820E, the world’s first handheld cable and antenna analyzer with frequency coverage up to 40 GHz, which continues Anritsu’s leadership position in the handheld analyzer market it established with the first broadband Site Master over 15 years ago. In addition to providing the widest frequency coverage of 1 MHz to 40 GHz, the Site Master S820E offers field technicians, engineers and wireless network installers industry-leading dynamic range, directivity, and durability so they can conduct highly accurate measurements during the installation, maintenance, and troubleshooting of microwave communications systems. 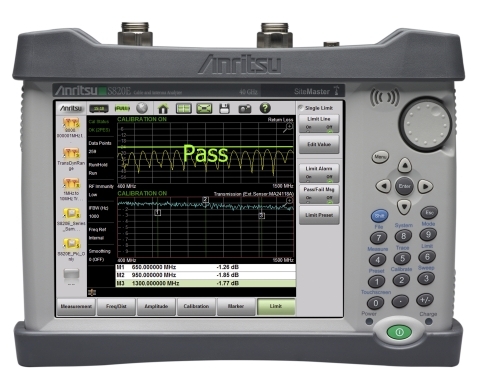 Additionally, Anritsu announces the Site Master S820E will feature Vector Network Analyzer (VNA) measurement functionality. With dynamic range of 110 dB up to 40 GHz, the Site Master S820E brings performance typically only achieved with a benchtop instrument into the field to address the measurement challenges of today’s wireless networks. Best-in-class frequency resolution of 1 Hz provides maximum frequency flexibility for users. The wide frequency coverage provides high-resolution distance resolution, so the handheld analyzer can conduct more accurate Distance-To-Fault (DTF) measurements. Anritsu Company (www.anritsu.com) is the United States subsidiary of Anritsu Corporation, a global provider of innovative communications test and measurement solutions for more than 110 years. Anritsu provides solutions for existing and next-generation wired and wireless communication systems and operators. Anritsu products include wireless, optical, microwave/RF, and digital instruments as well as operations support systems for R&D, manufacturing, installation, and maintenance. Anritsu also provides precision microwave/RF components, optical devices, and high-speed electrical devices for communication products and systems. With offices throughout the world, Anritsu sells in over 90 countries with approximately 4,000 employees.